Do you love to Disney cruise? You are probably as excited as I am about the Disney Cruise Line Magic being renovated! The maiden voyage of the newly imagined Disney Magic will be this Fall from the Port of Miami. She arrived in Cadiz, Spain for her makeover last weekend. As quickly as she got settled into dry dock the work has begun. Disney reports that there are well over 500 projects to be completed on this amazing renovation. Work is being done around the clock. There are shifts of people that will continue to work until the Disney Magic’s re-imagining is complete. 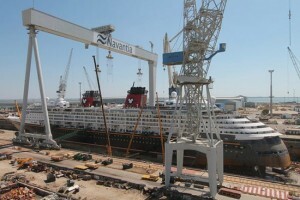 The renovation of the Disney Magic is one of the biggest ever performed in the cruise industry. Disney is cutting edge, as always. The dining areas are all going to be re-imagined. There will be a Brazilian-themed restaurant Carioca’s and a Cabanas. Animator’s Palate will still be there, but it is being updated to be interactive. The adult areas are going to be brand new. There will be three new nightclubs. Fathoms nightclub, O’Gills Pub sports bar and Keys piano lounge will offer something for everyone. The children’s areas are going to be filled with fun. There will be Marvel’s Avengers Academy onboard. There is going to be an amazing water slide. Disney Cruise Line’s first ship is going to be brand new. It is going to be amazing! Disney really wants everyone to sail on the Magic. They are offering some nice deals sailing from the Port of Miami during the holiday season. Disney Cruse Line has some really nice rates available for assorted stateroom categories out of the Port of Miami on the Disney Magic. These special rates are available for the 5-Night Western Caribbean sailings. This Western Caribbean itinerary stops in Grand Cayman and Cozumel. You will enjoy 2 days out at sea. The days at sea will give you time to fully enjoy the new Disney cruise experiences on the Disney Magic. Rates start at $125.00 per person, per day. This would be for the category 11C stateroom. Category 11C is an inside stateroom. The total for each person, with double occupancy in the stateroom, would be $625.00. The discount is available for most 5-Night sailings from November 1 to November 29, 2013. It is includes the sailing on December 13, 2013. The sailing on November 24, 2013 is excluded from this offer. To take advantage of this offer book it by September 30, 2013. The next deal is a sweet deal. Disney has an offer just released that works for guaranteed staterooms on the newly re-imagined Disney Magic. If you plan to sail on the Disney Magic between October 27, 2013 and November 15, 2013, this offer might work well for you. It is called the Category IGT Offer. The cost starts at $99.00 per person, double occupancy. The total per person will be $495.00. A guaranteed stateroom will not have a stateroom number assigned to it. The stateroom will be assigned just before or just when you are barding the ship. Keep in mind that all the staterooms will be brand new. You can choose your category, too. Here are some of the other restrictions. You must book this offer by October 20, 2013. Each guest’s full and legal name must be provided at the time of booking. No name changes will be allowed. Disney Cruise Line will require full payment at the time of booking The cruise cost is completely non-refundable. An OLP Travel agent will be happy to help you find the Disney cruise sailing that works for you. Don’t miss the chance to get a great rate on a newly imagined Disney Cruise Line ship.